Earlier this month, Rachelle and I visited her brother Philip and his family in Connecticut. While we were visiting, a blizzard happened. You can read more about our trip to Connecticut in my blog, Abstract Musings. The trip also gave me an opportunity to use my new camera, a Canon Digital Rebel XT. The principal reason for our trip was to meet our yougest nephew, Nathaniel, who was born in December of last year. 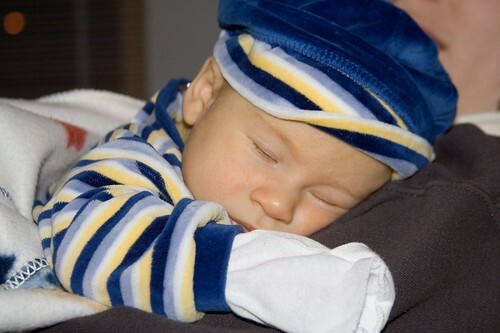 The little guy is resting comfortably in his Aunt Rachelle’s arms. 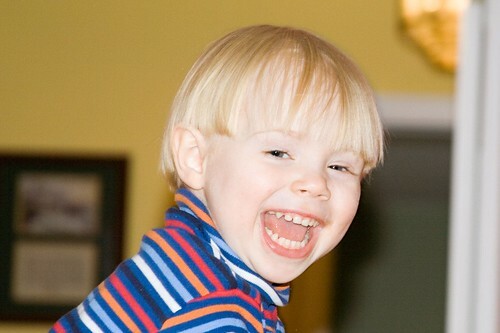 But we also came to see his older brother Caleb. As you can see, Caleb was very happy to see us. 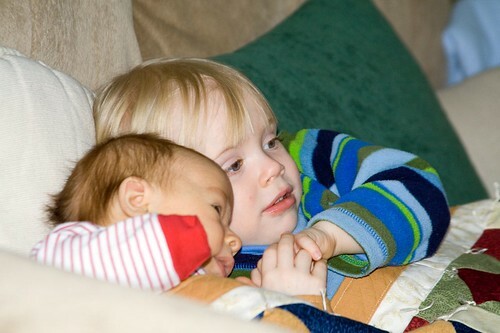 The two boys are huddled under the baby blanket Rachelle made for Nathaniel. In addition to seeing our family, another highlight of the weekend was being around for a record snowfall. Authorities have reported a one-eyed snow bandit was in the area. 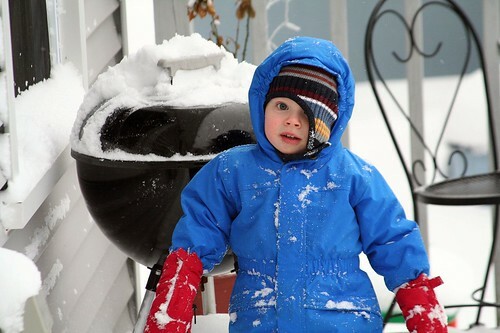 Caleb was excited to have so much snow in which to play. I must confess, so were his aunt and uncle! 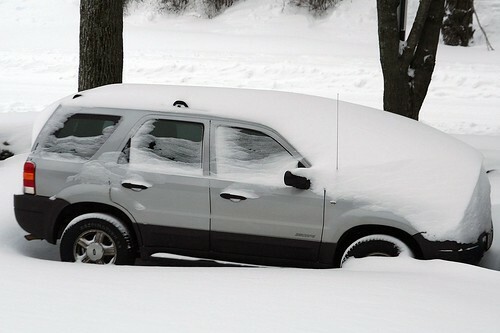 My car was buried by the blizzard. 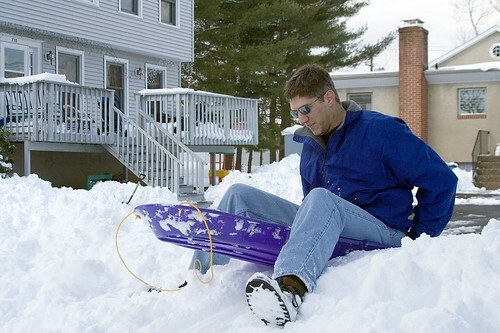 Fortunately, we had a couple of days to spend digging it out. 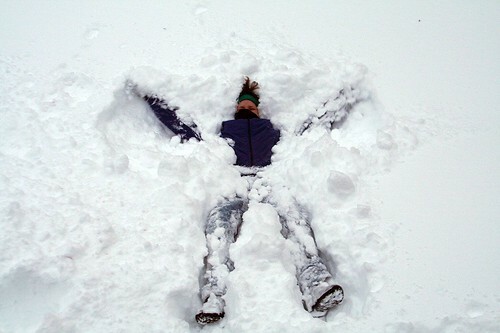 Rachelle also made a snow angel. 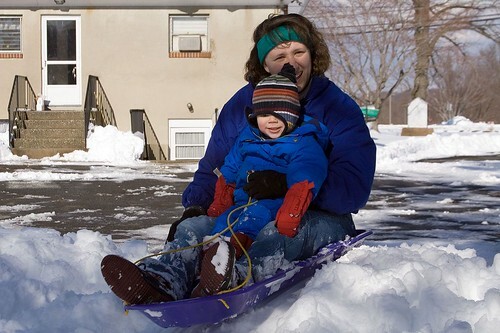 The day after the blizzard, Caleb sledded down a makeshift hill of snow which had been piled up by a snowplow. Rachelle required very little encouragement to join him. At some point Caleb asked me to go for a ride with him. How could I refuse? You can view more of the photos Rachelle and I took over the weekend in my photoset on Flickr or in my gallery.